Mount Evans is the highest summit of the Chicago Peaks in the front of the Rocky Mountains of Colorado at 14, 271 ft 4350 meters. * Tour available from May 28th to September 2nd due to the Mount Evans road closure. This tour is for people who are looking for adventure! Be ready for some of the most incredible views, only a short drive from Denver. Stop at the world famous Red Rocks Amphitheater, a natural historic monument and one of the best music venues in the world. It is known for its incredible natural acoustic embedded in millions of year old sandstone formations. Drive up the highest paved road in North America to the top of Mount Evans at 14,130 ft and then hike the rest of the way and you’ve climbed a 14er! 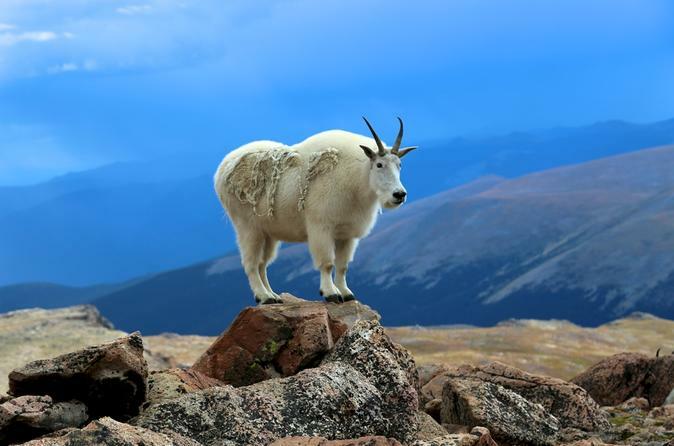 See bighorn sheep, mountain goats, marmots in their natural habitat. Enjoy incredible views, in a comfortable ride.